If you or your group or club wants to raise money to fight cancer, consider collecting funds through organizing one of the best Relay For Life fundraisers your community has ever seen. This popular American Cancer Society endeavor, founded in 1985, has raised millions of dollars for cancer research, in addition to saving countless lives. Besides fundraisers, Relay For Life sells promotional items to generate money for their cause. Judging what the best Relay for Life fundraiser is requires analyzing several factors. More than the amount of money that is raised measures the success of the event. The fundraiser should also celebrate cancer survivors, remember those who lost the fight, raise consciousness of the disease in the community and inspire others to organize future charitable affairs. Raising money for charity typically involves selling goods or services or sponsoring functions for which people pay to attend. 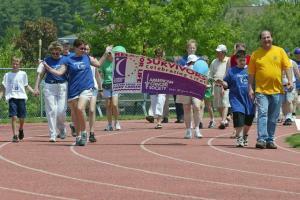 Relay for Life fundraisers commonly employ both methods. While selling products or services can be fiscally successful, charitable functions that directly involve the community and encourage camaraderie usually bring in more money and generate awareness and good will that fosters future fundraising functions. Most people enjoy socializing, especially when their fun benefits a good cause. The parties can be plain or fancy and range from conventional to quirky. Casino night: It may seem cliché or a trend from last century, but casino night fundraisers are generally the most favored and most successful ways to raise cash. You can keep it simple by focusing on poker tournaments or create a Las Vegas type atmosphere by renting gaming tables and slot machines and having local dignitaries serve as card dealers and cocktail servers. Adding extra events like cigar, whiskey or wine tasting increases the frivolity as well as the cash flow. Mardi Gras party: People come out of the woodwork to party like they're in New Orleans and usually spend money as if they are at the real celebration. Extra money is easy to generate through a Cajun themed buffet dinner, sales of Mardi Gras beads, and auctioning off a Mardi Gras trip donated by a local travel agency. Food is always a good way to raise money for charity, no matter what time of day it's served. Pancake breakfast: This is one of the most profitable and easiest events to organize. Get a local restaurant or club to donate the space and kitchen and have local volunteers cook and serve the flapjacks. While the guests chow down, sell them raffle tickets or have them bid on silent auction items. Dinner dance: Whether the affair is a classy, black-tie affair, a country line dance event or an oldies-themed party, dances that include dinner are always popular. Adding a cash bar or a dance contest brings in added cash and adds flavor to the festivities. If the aforementioned charity fundraisers have been overdone in your area or you just want to showcase your imaginative skills, try one of these approaches. Fundraising billboard: This is an easy way to raise money while honoring both cancer victims and cancer survivors. Get a local marketing company to donate a billboard and charge people a set fee around $100 or so dollars to put the name of a loved one on the board. Cow chip raffle: Although this type of event can only be pulled off in rural areas with plenty of cows, it never fails to inspire fun. Get a local farmer to use a tractor to mark off squares in a cow pasture and sell the squares for $20 or $30 each. When one of the cows marks one of the squares with a natural call, the person who bought the square wins a substantial cash prize. Throw in a live music band, some barbecue and down-home games like egg walks and sack races to add coffers to the charity till. Whatever event you choose to raise money, you will learn valuable lessons from the experience. Play close attention to feedback from the community and remember what events were most enjoyed and raised the most money when planning your next Relay For Life fundraiser.